With the increase in standard deduction in 2018 for individuals, it is estimated by the Tax Policy Center that of the 46 million people who itemize, only 19 million will continue to itemize deductions on their tax return in 2018. 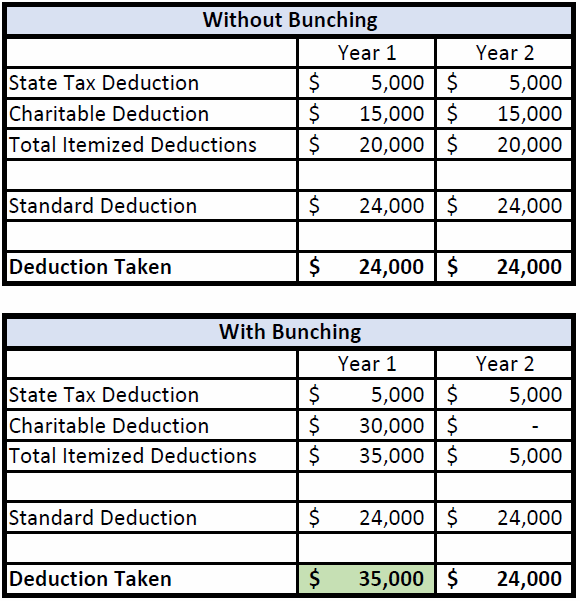 Taxpayers are seeing less benefit by itemizing due to the increased standard deduction, but they may be able to bunch their deductions to still receive some benefits from itemizing their deductions. Bunching charitable expenses is spending and deducting expenses from two years (or more) into one year. How this is accomplished is by picking a year to start and paying double (or more) the charitable amounts that one would normally pay in any given year. It may sound difficult to accomplish, but it could be done with only one month difference in paying time. A person could pay all their regular charitable deductions in January of 2018 and then pay the charitable deductions that they would normally pay in 2019 in December of 2018 instead. With bunching the taxpayers can take advantage of $11,000 more in deductions over the two year period. At the 12% tax bracket, that is the potential of $1,320 in tax savings, plus any additional that could arise from other potential tax credits or lower state income tax. 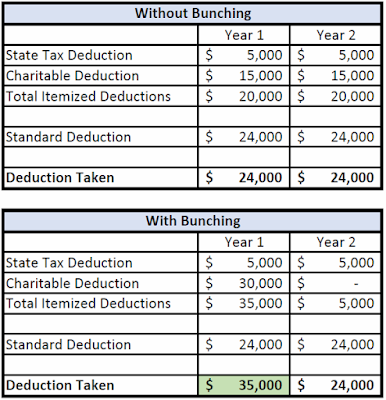 $1,320 or more in tax savings every two years could be worth the additional planning and preparation it may take to begin bunching charitable deductions.